In the world of collectible cars, rarity equals value... And they don't come any rarer than this. There was only one ever made. 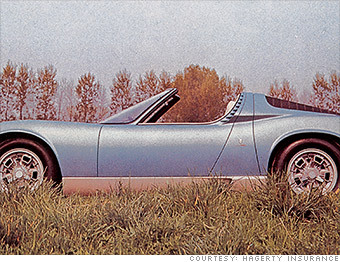 This open-top Miura was built for the 1968 Brussels Motor Show. The Miura is generally considered to be the most beautiful Lamborghini model ever. With Lamborghini expected to unveil a groundbreaking new car at the Geneva Motor Show next week in honor of the automaker's 50th anniversary, we asked collector car insurer Hagerty Insurance to put together a list of the most sought-after classic Lamborghinis. For the most part, classic Lamborghinis are far less valuable than classic Ferraris, which represent the pinnacle of collectible automobiles. In fact, a couple of the cars in this gallery, while certainly not cheap, can be had for less than the cost of a brand new Lamborghini Gallardo. Still, these are not exactly your average used cars.